No doubt there have been diaper pails as long as there have been diapers. Once upon a time, a bucket was probably fine. Today you have a number of different diaper disposal systems from which to choose. One of the diaper “pails” that is effective at keeping the smells in, yet doesn’t require any special bags to use, is Baby Trend’s Diaper Champ. It requires no assembly, and it’s very easy to use. You put in any 13-gallon trash bag. (You can buy special Diaper Champ bags, but you don’t have to.) You pop the dirty diaper in the top, and then swing over the lever. The diaper spins around in the container and falls down into the bag. The Diaper Champ holds 30 diapers, and it comes in pink and blue. 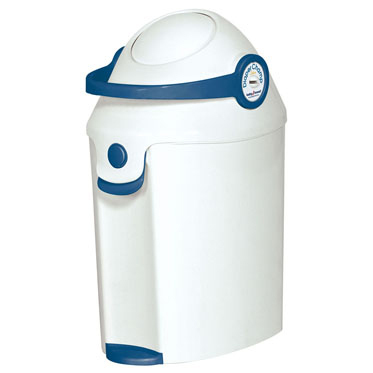 You can use the Diaper Champ for both cloth and disposable diapers. You can buy Diaper Champs online and in stores for around $30. Visit BabyTrend.com for more information.